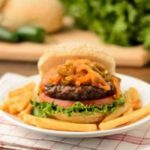 A recipe for a Volcano Buffalo Burger. It has a hot and spicy topping made of wing sauce, onions, and jalapeño peppers. A burger for spicy food fanatics. Heat olive oil in a large skillet over medium heat. Add the onion and jalapeños. Sprinkle with salt and pepper. Cook, stirring occasionally, until onions are soft and translucent, about 20 minutes. Reduce heat if onions are browning. Add wing sauce and stir to combine. Simmer for 5 minutes. Remove from heat. Shape the ground beef into 4 patties. Season with salt and pepper. Cook or grill patties to desired doneness. Place lettuce and tomato on the bottom half of the buns. Top with hamburger patties. Spoon volcano buffalo topping over patties. Cover with top half of buns.